I am a regular visitor to Switzerland, being married to a swiss, and so when visiting, I occupy the privileged position of being able to observe the swiss at close quarters. I am now (almost) able to understand what is being said in swiss german after many years of my GCSE- level German being utterly useless in the face of the sing-song gobbledygook that is ‘Sweetzer Dooch’. A couple of years ago I thought things were looking up when, sitting on a plane leaving Amsterdam for Zurich I had a breakthrough. ‘Hey! I can understand everything that flight announcer is saying!’ I chirruped enthusiastically to my husband. ‘He’s speaking Dutch’ he replied dryly. The spelling appears to be mostly arbitrary in Swiss German, as they use High German for written documents, so I feel justified in using my own form of phonetic written Swiss here, I hope you are saying each phrase out loud to yourselves, don’t they sound funny? We regularly visit the same places each year and each visit I feel a little like an amateur anthropologist, trying to understand Swiss people and Swiss culture, and trying to fit somewhat into a place so utterly alien from the comfortable chaos of life in Scotland. I thought I should write a few observations of Switzerland and the Swiss to help me get through the visits. In the spirit of ‘if you can’t laugh, you’d just cry’. It might also act as a bit of a survivors’ guide to visiting Switzerland. 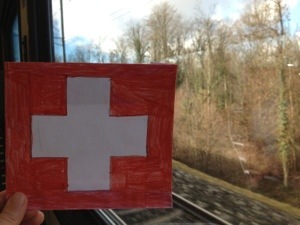 This entry was posted in Miscellaneous and tagged language, Swiss survival guide, switzerland by nager. Bookmark the permalink.